Apple today seeded the fourth beta of an upcoming iOS 11.2.5 update to developers, one week after seeding the third beta and almost a month after releasing iOS 11.2.1, an update that introduced a fix for a HomeKit vulnerability. iOS 11.2.5 introduces a new feature that allows Siri to play daily news podcasts when queried about the current news. Siri will offer up news from The Washington Post by default, but you can also choose to switch to Fox News, CNN, or NPR. The new audio news feature, which appears to have been developed for use with Apple's upcoming HomePod speaker, is invoked when using Hey Siri or asking Siri about the news when using CarPlay or with headphones connected - essentially any situation where you're not looking at the display of an iOS device. If you activate Siri using the side button or Home button of a device, standard Apple news headlines are provided instead of the audio-based news highlights. It's not clear what other new features, if any, will be included in the iOS 11.2.5 beta. 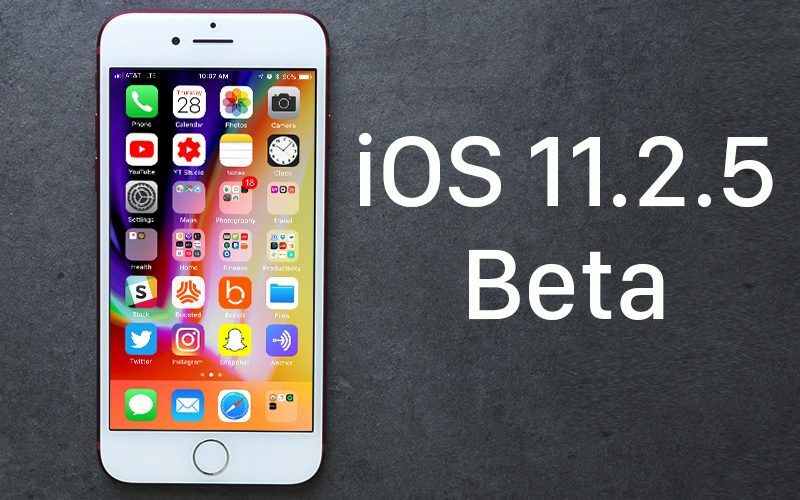 We didn't discover other noticeable outward-facing changes in the first three iOS 11.2.5 betas, so it's possible this update focuses mainly on bug fixes and security improvements aside from the Siri news update. If that's the case, we may not know the extent of what's in the update until it sees a public release. Apple is supposed to be releasing an iCloud Messages feature that was pulled from the iOS 11 release, but there has been no indication of when we can expect iCloud Messages to be reintroduced. Should new features be discovered in the fourth beta of iOS 11.2.5, we'll update this post. Update: Apple has also seeded a new public beta of iOS 11.2.5 to public beta testers. Appears there have been adjustments to IPT, Safari handling of cookies, further Meltdown and Spectre protections, and a number of other changes in this build. Did they fix the loud speakers issue? If you have your keyboard typing sounds on, everyone around you hate you. I am shocked enough people have this setting on to even notice this bug. If it takes an update to iOS to add Siri support for a couple of apparently hard-coded podcasts, then Apple has totally and completely lost the AI voice assistant race. Are these posTs necessary every time a developer beta pops?? I am wondering if they release an update without downgrading performance or removing some functionality? No need to wonder. Since Ive has been in total control, you can be assured he will do both everytime. 11.2.5... still waiting for my Custom Ringtones to start working again. But pretty sure they never will. Doesn't really seem like there was anything indicating that it was ready for primetime. Or they can just download and install the developer profile which is widely available instead of posting this if they really have to have it when we do. At this point, I fully expect that iCloud Messages will be released as part of iOS 12. They'd better make sure that thing is fully baked and flawless. I have text messages on my iPhone that go back to 2009. Call me sentimental, but I don't want to lose those. If iCloud Messages does to text messages with Apple Music did to some locally-stored music libraries, I'll pass.